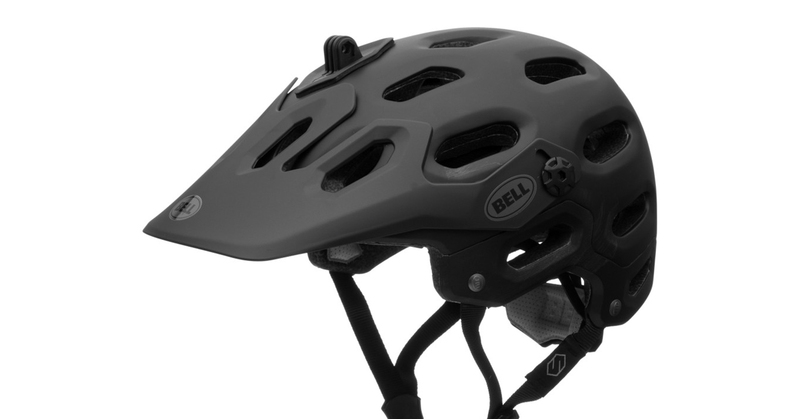 Bell Helmets have culminated decades worth of helmet research and design into the new Bell Super XC/Enduro style helmet and it really shows. Everything from the straps and inside liner to the gopro mount and adjustable visor are made from high quality materials and the helmet itself just feels solid. The super drops low in the back and sides to cover more of your precious skull and has one of the most accommodating fit adjustment I’ve ever seen on a bike helmet. Be sure to consult the Bell helmet size chart to see what size you should actually order. I had assumed that I would wear a LARGE size because I’m 6’2″ adult male, but after measuring my head, found that I should actually wear a MEDIUM sized helmet. Sure enough, this helmet fits like a glove! Looks great and I’ve already got some compliments on it the first day that I wore it out. I highly recommend this helmet for anyone who rides a mountain bike off-road and wants a serious helmet that looks cool too. The helmet itself is still in great condition after 2 years of rough travel and even rougher travel. The integrated GoPro mount, however, it was never really that great to begin with. The mount fits inside of the front-most air vent and has two small velcro straps the attach to small pads inside the helmet. The problem is that these pads are only glued to the foam interiorÂ and, under the weight of the mounted camera, have become unstuck and will not stick again. Â Bell has since released the Super 2 helmet which corrected this issue and added MIPS technology for added safety, so if you like the look of this lid and want an action camera mount that you can actually use, go with the newer model.